The island of Ugljan is only 25 minutes away from Zadar by ferry. It has foresty bays and crystal clear sea, sand beaches, walking and cycling trails, lookouts with magnificent views of the Zadar's archipelago and stone fisherman's huts. 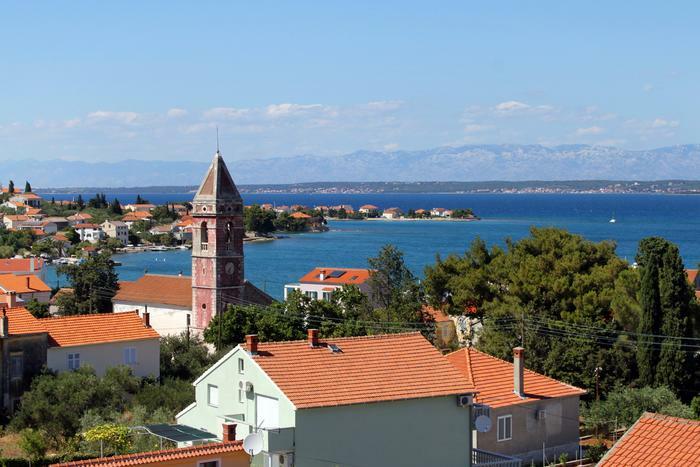 In addition, the vicinity of places to go on trips to like Telašćica Nature Park, the island of Pašman or the city of Zadar make Ugljan a perfect place for a peaceful and fulfilling family holiday. Keep on reading and take a look at our top 4 things you to do on Ugljan, together with other important information about this island. How to get to the island of Ugljan? Ferries and speed boats sail out from Zadar to Ugljan every day. The 25 minute ride ends at Preko where the ferry docks. Walking around is a great way to get to know Ugljan. Of course, if it's not too hot. Walking enthusiasts have even 20 different trails to choose from. If you're in shape, walk to the very top of the island of Ugljan – Šćah, have a bite to eat and admire the view of Zadar and its archipelago. Take a walk to the beautiful bay Željina vala and a swim or just explore the island strolling around its olive yards, old churches or walking by the sea at dusk. If you prefer to get to know Ugljan on two wheels, rent a bike at Preko and take one of the five cycling routes. The routes are of different lengths and different difficulties, so everyone will be able to find one that suits their capabilities. Don't forget to dress appropriately considering the steep and slippery terrain at certain points. Sneakers are the best choice. Don't forget to take some water, sunscreen and a hat with you. Your stay on the island of Ugljan is not complete without a visit to the medieval fortress of St. Michael located on a 265 meters high hill above the village of Preko. You can climb the hill from different directions, but the best and the easiest way is to take the 2.5 km long walking trail Preko – St. Michael. The climb takes an hour. For an even better experience at the top, pay a visit to the fortress in dusk on a sunny day. You can take a meal with you because it will be even more delicious when looking over the archipelago of Zadar. A lot of excursion boats offer one-day trips to nearby islands and destinations such as Plitvice Lakes National Park or Krka National Park. On the other hand, you can get to nearby cities like Zadar which will amaze you with their historic heritage. Still, the place closest to Ugljan is Pašman. You can get there by car since the two are connected with a bridge. We recommend dedicating an entire day for visiting Telašćica Nature Park on the south side of Dugi otok. You can get to Telašćica from Kali by a boat. Excursion boats sail out every day. Do not miss out on the Telašćica bay the park was named after, salt water lake Mir which is always warm, and the magnificent Stene – huge cliffs up to 160 m high. You can also take a ferry to the little island of Sestrunj which provides peace and quiet. More than 20 km of coast, amazingly clear Adriatic sea, green pine forests. Those are only some of the reasons why people love the island of Ugljan in the summer. It is home to pebble and a couple of sand beaches (such as Jaz beach) which are ideal for families with children. The underwater world of Ugljan hides some historic secrets – various archaeological sites can be found at different locations and that is why these areas are very popular among divers. If you're one of them, visit the Ugljan diving center where you can, together with experts, investigate the local underwater.